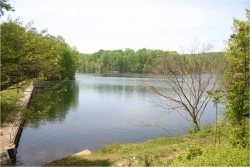 The Ragged Mountain Reservoir sits directly South-West of Charlottesville, near the Fontaine Research Park. It consists of two lakes, an upper and lower portion, that total 50 acres in area. The reservoir is surrounded by the 980-acre Ragged Mountain Natural Area, established in 1997 in order to protect the immediate watershed of the reservoir. The natural area and reservoir are free and open to the public everyday between 7:00 AM to dusk. 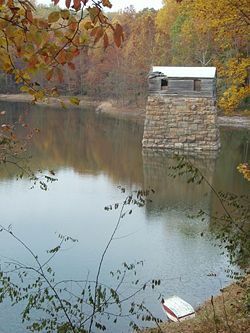 The Upper (circa 1885) and Lower (circa 1908) Ragged Mountain Reservoirs are a key component of the community water supply maintained by the Rivanna Water and Sewer Authority. As of 2011, A plan to build a new Ragged Mountain Dam at the reservoir is under review as part of the 50-year community water supply plan (2005-2055). Former City Councilor Kevin Lynch once suggested building a new dam 33 feet higher than the existing one. "In 1888, when Charlottesville became a city, its leaders considered construction of an electric plant, but Eidson's magic bulb was not in general use locally until 1901. Fully a decade before the town entered the gas business, the state legislature authorized construction of a municipal waterworks. It was not until February 1885, however, when yet another law increased the amount that could be borrowed and permitted the university to share both costs and benefits of the project, that work actually began. With sale of $70,000 in bonds, pipe-laying and trenching got underway and was complete by mid-July. Soon water was flowing to the town and university from the reservoir situated in the Ragged Mountains between Round Top and Newcomb's Mountain. To pay for this luxury citizens faced a substantial increase in the tax rate (from sixty cents to ninety-six cents per $100), but most were more than willing to pay for a service which provided clean drinking water and reduced the hazard of fires." ↑ Moore, John Hammond. Albemarle, Jefferson's County, 1727-1976. 1976. Charlottesville: Albemarle County Historical Society, 1986. 247. This page was last edited on 29 April 2011, at 15:42.